They’re innovative, smart and forward-looking. They attract people, businesses and investment. These are just some of the reasons that London, New York, Paris, Singapore, Tokyo, Hong Kong and Seoul are the seven best-run cities in the world, according to The Universe of City Indices 2017. The league table, compiled by JLL, a global real estate services firm, has remained more or less the same since its launch in 2013. But there are changes on the horizon. London and New York head up the list: “This duo continues to lead for corporate presence, magnetic appeal to talent, attraction to capital, and soft power and informal influence,” says JLL. The two cities continue to attract large amounts of commercial real-estate investment, over $250 billion between them. New York and London's dominance may be challenged, however. The UK is still grappling with its exit from the EU, and it remains to be seen how the US government’s protectionist policies will play out. In both scenarios, the ability to access international talent, a key attribute of a successful city, could be hampered. Meanwhile, other cities are lining up to compete for the leading positions. Paris, currently third on the list, is busy implementing one of the most ambitious infrastructure programmes in the world – the ‘Grand Paris’ project. The French capital will also host the 2024 Summer Olympics, providing another opportunity to boost its global reputation. Singapore is fourth on the list. The city-state has long invested in its infrastructure, including its plan to become a “smart city”. That said, it faces strong competition from its Asian peers. Tokyo, in fifth, will host the Olympic Games in 2020, which, according to the report, offers it a “once-in-a-generation catalyst for change”. In sixth place, Hong Kong is among the world’s most globally connected cities – more than 150 international destinations can be reached from Hong Kong International Airport. Long deemed a contender to what was the Big Six, Seoul has joined this year’s list to create the Big Seven. The city has equipped itself for the 21st century through a combination of modern infrastructure, innovative global firms and exceptional digital connectivity, says the report. It has raised its business and visitor profile, developed world-class universities and is building its innovation capacity. However, Seoul’s position within the elite group is far from safe. It faces challenges including geopolitical tensions in the Korean peninsula, a lack of openness and comparatively low transparency. The ranking is compiled according to analysis of 44 indices that score, benchmark and rank cities on almost every aspect of urban life. Hot on the heels of the Big Seven are 10 cities: Los Angeles; Shanghai; Beijing; Amsterdam; Chicago; San Francisco; Toronto; Madrid; Sydney; and Washington DC. Beijing and Shanghai have been helped in no small part by China’s ambitious Belt and Road Initiative. Chinese investment along the Silk Road is soaring, and marks the next step in these cities’ global ambitions, according to the report. Of the three US cities closing in on the Big Seven, Los Angeles is the closest. 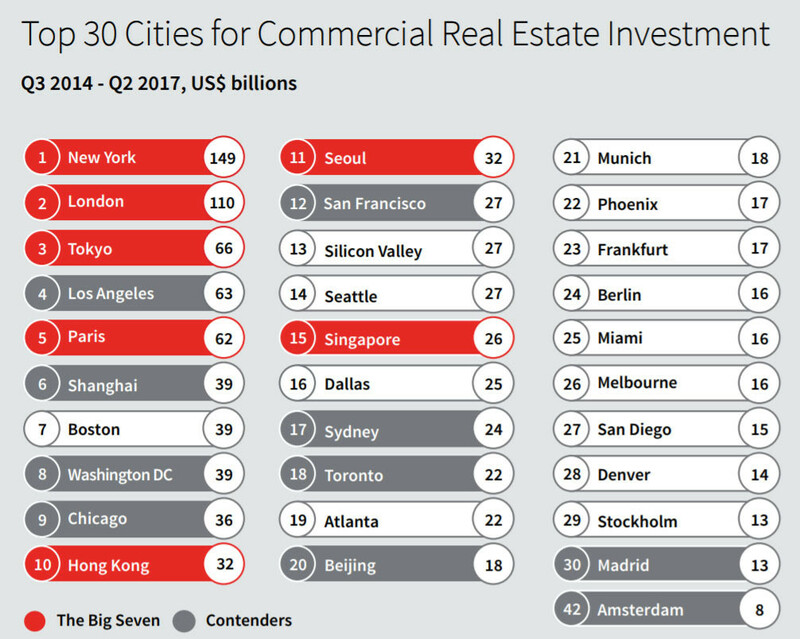 And though together Chicago and Washington attract some $70 billion in real-estate investment, they lack some of the global gateway functions and infrastructure platforms required to make the step up to the top group, according to JLL. There are 10 things that define a successful city, according to JLL’s analysis. Top of the list is the ability to foster innovation pathways. This means hosting tech start-ups, corporate R&D, or having knowledge-intensive industries. Uncovering hidden talent is also important. But this doesn’t just mean having a pool of well-educated, experienced people, cities also need workers with a range of vocational and specialist skills and to promote diversity and inclusiveness. Of the Big Seven, London and Paris are the best at attracting talent. Investing in infrastructure is critical to the successful functioning of a city and to ensure its future growth – this includes everything from a well-functioning public transport system to a high degree of digital connectivity. According to the World Economic Forum’s Shaping the Future of Long-term Investing, Infrastructure and Development, there is a global $1trillion infrastructure investment gap. Thinking long-term is also critical to a city’s success. Municipal governments need to plan for managing pollution and climate change, and fostering resilience in the face of change. A well-run city requires good governance. This is critical for managing growth as cities that are viewed as stable also attract investment. Ensuring transparency is a key factor as well. Cities are increasingly differentiated by their business environments, market openness and levels of risk, says the report. Being smart is important. This means making long-term plans to integrate new technology into city operations, from waste management to public transport. But there is little use in having a well-run, smart city if workers can’t afford to live there. So keeping it affordable is also important. The reputation of a city matters, which is why building a brand is among the top 10 contributing factors to a great city. Brand is key to attracting businesses, talent and visitors, and cities are using innovative real estate and impressive skylines to project their brands and identities, according to JLL. Finally, no city could compete without going global. New indices are emerging from regions as diverse as Latin America, Asia and Africa, meaning that the Big Seven could look very different a few years from now.